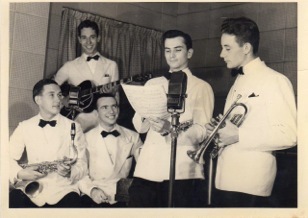 The Writing Well is delighted to pay tribute today to a special music maker — my husband’s 99-year-old grandfather, Charles (Chuck) Coe. Last week, he received a lifetime entertainment award from Second Wind Dreams®, a non-profit devoted to granting a dream to those living in eldercare communities or in hospice care. 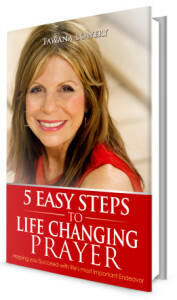 The organization, begun in 1997, has fulfilled more than 10,000 dreams nationwide since its founding. Chuc k, a World War II vet and graduate of Purdue University, earned his way through engineering school as a band leader and musician, playing clarinet, flute and saxophone. 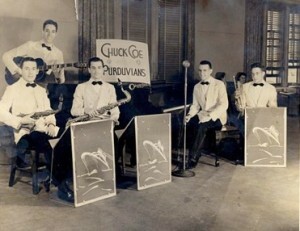 His group, “Chuck Coe and the Purduvians” performed at dances and special events, and even made three cruises to Europe and back entertaining passengers. When the war came, Chuck served as an Army captain in the 2nd Armored Division’s Hell on Wheels, where he was part of the D-day invasion + 3. He was head of communication for the battalion, making sure all the radios worked. 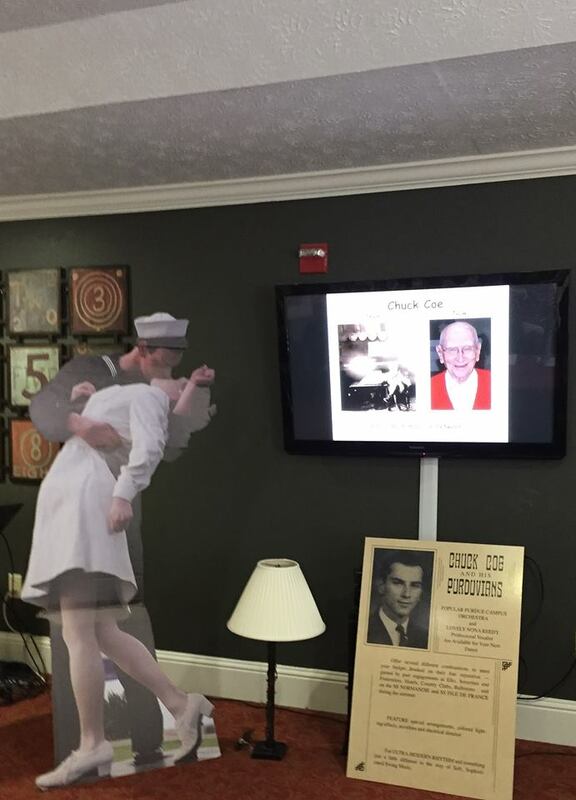 I could feel the love and regard for Chuck as residents, staff and family members came to pay their respects at his assisted living home in Roswell. 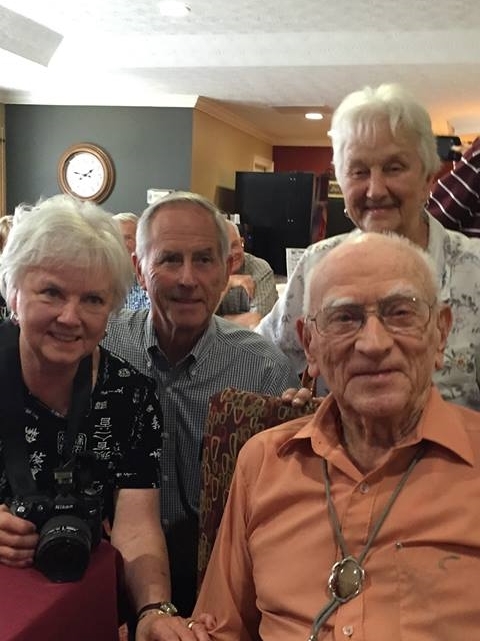 His three children and their spouses were on hand, as well as my husband and our two kids, who are his great-grandchildren. “Wow, sure appreciate it,” said Chuck, after receiving the award. Sue Hamilton hugging Chuck — she coordinated Chuck’s musical tribute. Sue Hamilton, the healthy lifestyle coordinator for the facility, planned and executed the entire event, serving as liaison with Second Wind Dreams and securing entertainment. 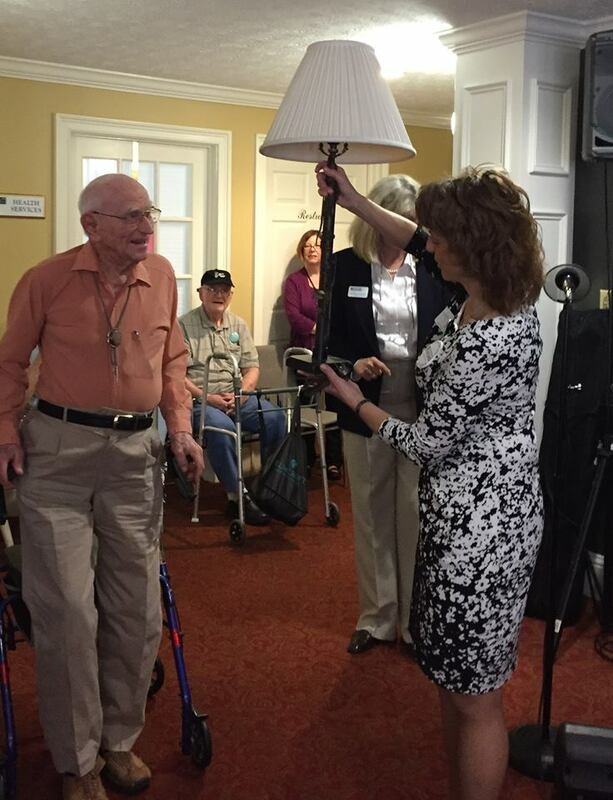 She hugged Chuck and showed everyone a lamp he fashioned from his old clarinet. She then introduced Amber, who transported everyone back to the big band music of the 40s, kicking off her tribute singing Billie Holiday’s “What’s New?” before delving into countless Glenn Miller tunes. Chuck with his kids (L to R) Linda, Larry and Carol. Carol was only two years old when her father went off to war, and was in kindergarten when he returned. 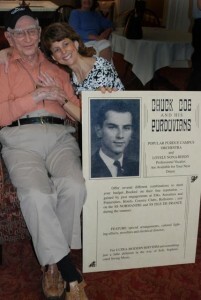 Her brother, Larry, was just an infant when he returned home. 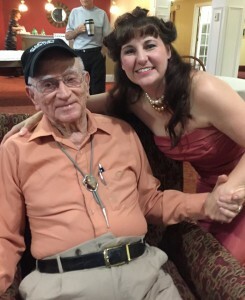 Chuck with Amber after her musical performance. Amber explained that Chuck told her he played the saxophone and the flute and pretty much any woodwind in his orchestra. She notes that all the Big Band songs have a specific order– first you sing two verses, then a chorus, and then there is a dance break before you come back to do a chorus again. This entry was posted in Inspiration, Leadership and tagged Chuck Coe, Glenn Miller, Musical tribute, Second Wind Dreams, WWII on September 22, 2015 by AnneWainscott. 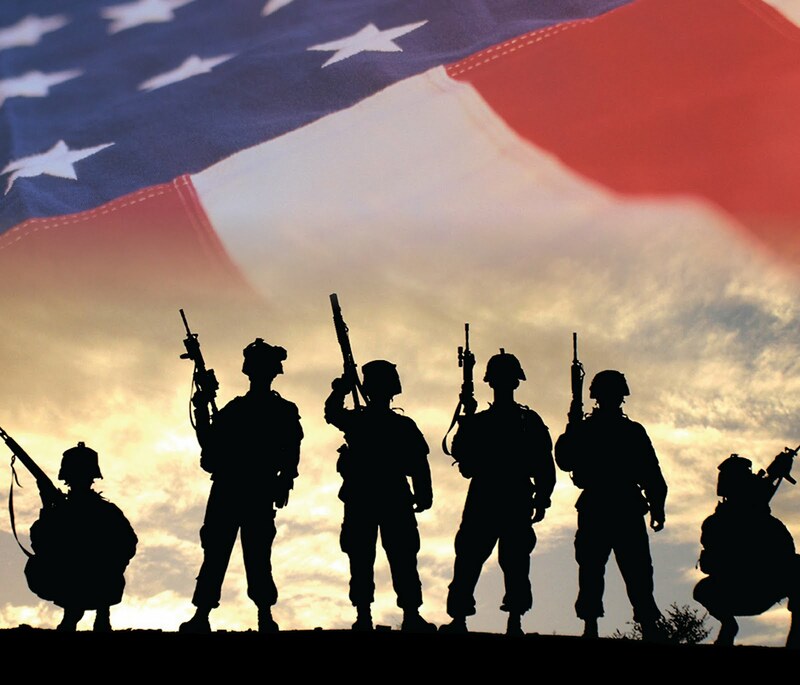 Today, as America honors those who have served their country, The Writing Well revisits this blog’s most poignant posts with veteran themes over the last four years. Published on U.S. Memorial Days, the 4th of July and other dates of significance to the nation, these entries are examples of storytelling that underscore the power of words to move and heal. 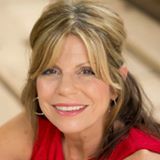 They include interviews with memoir, fiction and non-fiction authors who served or lost loved ones during times of war, an Army chaplain researching how a family member tended to the physical and religious needs of Civil War soldiers, as well as memorable war-time speeches and books worth reading. 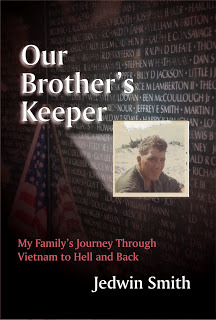 Jedwin Smith’s memoir, originally released in 2005, details the loss of his younger brother, Jeff, the family’s “peacemaker,” during the Vietnam War, and his journey to find out who killed him. Since its release, Our Brother’s Keeper has been widely used by the VA and by the Wounded Warrior Project®, serving to heal many veterans and bring closure to families still reeling from the sacrifice of their loved ones. Dr. Bill Nisbet, a retired Army Reserves chaplain who serves on the pastoral staff of my church, shares his journey re-publishing The Confederate Soldier’s Pocket Manual of Devotions, a 1863 book compiled by Nisbet’s great-great-great grandfather, a medical doctor and chaplain of the First Tennessee Regiment, who cared for the physical and spiritual needs of soldiers as a hospital field surgeon. 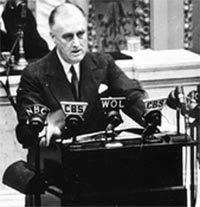 From American presidents FDR and Abraham Lincoln to esteemed British Prime Minister Winston Churchill, these famous orators delivered patriotic speeches that have inspired generations, and made a lasting impact on the public during times of trial and times of healing. These three books — two works of historical fiction and one non-fiction work– memorably captured a soldier’s struggles and experiences in wars past and present. They include my all-time favorite historical novel, The Killer Angels by Michael Shaara. 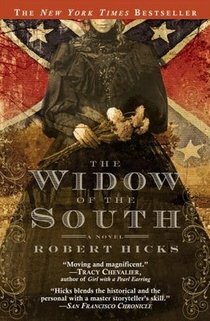 I relished this in-depth interview with Robert Hicks, acclaimed author of two engaging historical fiction books about the Civil War and its aftermath. The first, The Widow of the South, is the tale of Carrie McGavock, a headstrong wife and mother who, in November 1864, finds her plantation home turned into a field hospital during the devastating one-day Battle of Franklin (widely considered as among the five bloodiest hours in the entire war). 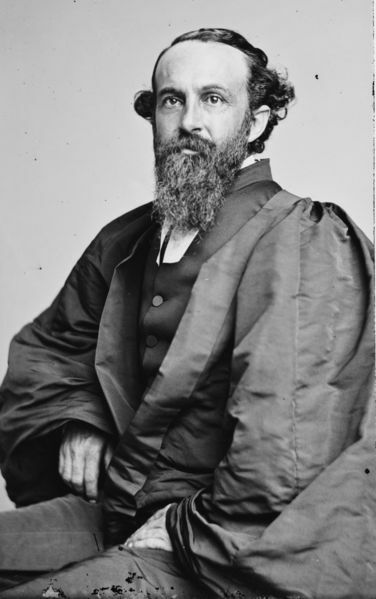 Robert’s second novel, A Separate Country, takes place in New Orleans in the years after the Civil War, and focuses on the life of John Bell Hood, arguably one of the most controversial generals of the Confederate Army–and one of its most tragic figures. No soldier should be without a book — that sentiment formed the inspiration for creating this charitable foundation that ships books to soldiers free of charge. Thanks to the generosity of numerous book publishers, bookstore customers and trucking firms, Books for Heroes has shipped thousands of books to armed forces in Afghanistan, VA hospitals, and U.S. military bases. The charity got a major boost when bestselling author James Patterson donated 200,000 of his own books to the cause. 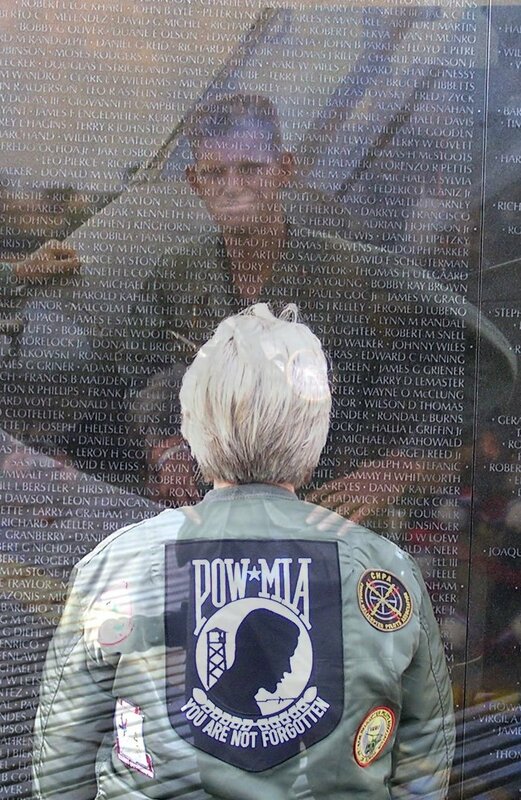 This entry was posted in Inspiration, Leadership, Memoir Writing and tagged Books for Heroes, Civil War devotional, FDR, honoring veterans, Jedwin Smith, Mark Helprin, Robert Hicks, Vietnam War, WAR, Winston Churchill on November 11, 2013 by AnneWainscott. As an organizational storyteller and a history buff, I’ve seldom tackled a more fascinating writing assignment than this: chronicling Wharton Executive Education’s program that brings lessons of leadership from actual sites of major historical battles. The unique learning engagement has taken business leaders from the fields of Gettysburg, to the beaches at Normandy and the Italian Peninsula to understand and learn from the commanders who led military forces and fought in these locations during the Civil War and WWII. Rather than relying on classroom lectures from imminent historians, program participants actually toured the hallowed ground where blood was shed, and, in the case of the WWII locations, heard from surviving eyewitnesses. 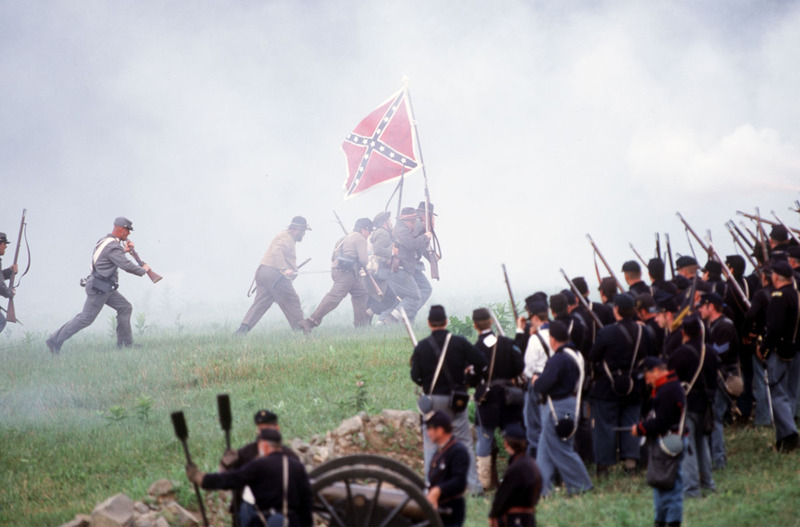 For the past decade, Wharton has hosted scores of alumni through the fields of Gettysburg to recreate the critical decision-making moments and their outcomes of the most famous battle in the Civil War and widely considered its turning point. In the case of Gettysburg, Wharton participants studied Confederate General Robert E. Lee’s less-than-clear strategic intent to his commanders in the field, notably Gen. Ewell. Wharton also showed the initiative and innovative actions early on by John Buford, a Union cavalry commander who first arrived at Gettysburg before the Confederate army was concentrated for battle. He quickly grasped the significance of the high ground south of the town, galvanizing his cavalry to hold back the Confederates until Union reinforcements could arrive. 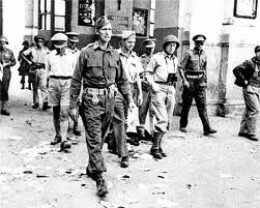 General Mark Clark entering Rome in 1944. This past September, Wharton also hosted a three-day trip to Italy, where 24 global business leaders retraced the steps of Lt. Gen. Mark Clark, leader of the 5th U.S. Army in Italy, through a series of battles along the Italian peninsula begun in September 1943. 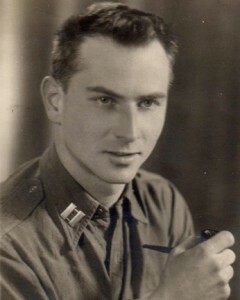 Clark was tasked with disrupting entrenched German forces in preparation for the Normandy invasion the following June. The path forward for the Allies was daunting given German fortifications and central Italy’s narrow and mountainous terrain with high, barely passable trails, open valleys and rivers. 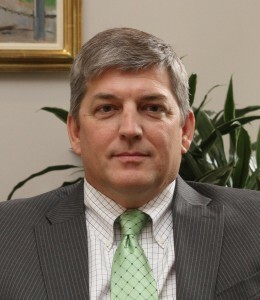 “The reason we decided to go to Italy was because it’s an example of multiple failures of leadership – failures in strategy, failures indecision making,” recalls Todd Henshaw, PhD, director of Executive Leadership Programs at The Wharton School and former director of leadership and management programs at West Point, where he served as a key author and designer of the Academy’s leadership programs. 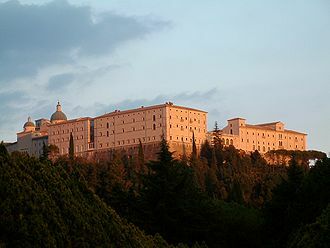 the monastery resulted in significant civilian casualties, it ultimately resulted in Germans being pushed out of the area, the monk stated. Woven into the on-site experiences was a full day of classroom lectures, where participants explored their own personal leadership styles and reviewed a Harvard case of the May 10,1996 Mt. Everest disaster, where eight climbers died after a fast-moving storm hit the summit, trapping climbers on the mountain. The 1996 disaster, which claimed the lives of competing team leaders Rob Hall and Scott Fischer, remains the worst loss of life on the mountain on a single day. So, what’s been the impact of the most recent program? Feedback from the Italy participants has been universally positive. Many attendees said eyewitnesses really brought the leadership challenges to life for them. The vividness of learning about leadership breakdowns rather than leadership successes is helping them better understand their own styles of decision making and how to be better leaders to their own teams. One, How do I set conditions and shape the environment so my people can be successful? Two, How do I bring innovation back into my workplace? How do I allow it? How do I build a climate for it? How do I ensure I share the best thinking across the team and across the organization? 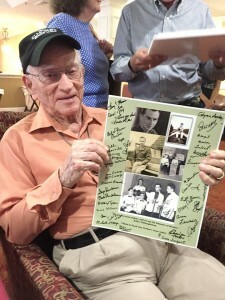 This entry was posted in Leadership, Travel & History and tagged Batlte of Gettysburg, Developing leaders, General Mark Clark, Italian campaign of WWII, leadership lessons through history, Normandy, Wharton Executive Education on October 31, 2013 by AnneWainscott.